Rising rates of stock ownership and home ownership in recent decades notwithstanding, the families with the highest incomes are receiving a growing share of total capital income. The Figure shows the share of capital income that went to different income groups in 1979 and 2006, the last year for which data are available. In 1979, the top 10% of families received 67.0% of all income generated by assets such as stocks, bonds and real estate. By 2006, that share had risen to 81.3%. By contrast, the share of capital income that went to the other 90% of families has fallen from 33.0% in 1979 to 18.7% in 2006. 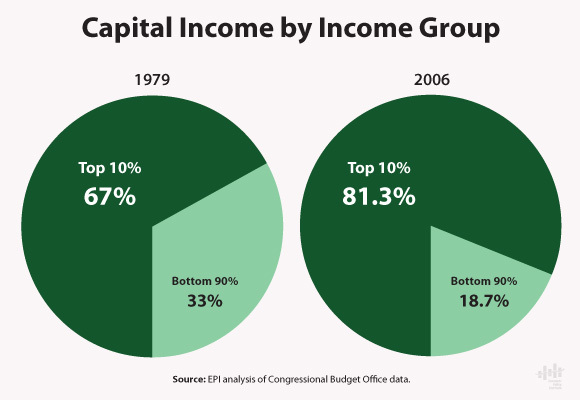 The portion of capital income going to the top 1% of families has gradually increased from 38.0% in 1979, so that by 2006 this small group received more than half – 57.7% — of all capital income.